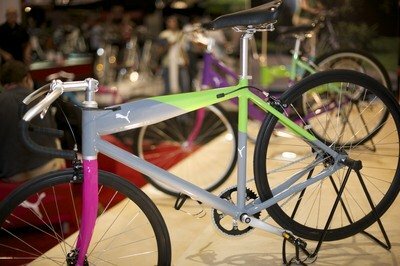 We spotted this Puma among a collection of oddly-painted siblings at the Puma booth at Interbike while gliding between appointments. We had really expected there to be shoes or soft-goods and so the brightly-colored bikes sort of threw us. Personally I dislike the multi-hued bikes, they don’t fit my sense of style at all, but of course I’m a suburban hipster, not an urban one. But I’m sure there are people who dig the split-fluorescent paint jobs as much as they revere their Puma Baskets. The bigger issues here have to do with build quality and distribution. Puma’s not aiming at the independent bicycle dealer, which we think is great. These bikes are more likely to end up at Urban Outfitters than at Gotham Bikes, and we’re okay with that. Many people feel intimidated by the IBD and so would prefer to buy their bikes where they buy their clothes, furniture and artwork. But that brings up the second point, which is the build-quality. We’ve ridden some Biomega bikes and really were dismayed at some part and construction choices. Ball-bearing headsets, low-cost parts choices–if you’re going to make a bike that’s sold without a support system in place, make it durable enough to not need service. My Felt Curbside fixie has ridden two seasons in every condition and it’s never needed a repair because it’s the bomb. I’m pretty sure I could destroy one of these Pumas faster than I could wear out a pair of sneakers.